optimal cooperation for a temperature increase limited to 2°C. Those scenarios may be compared to the business as usual scenario (the same as in the first phase), and share common assumptions. a commitment to "mobilizing jointly $100 billion a year by 2020 to address the needs of developing countries. The funds will come from a wide variety of sources, public and private, bilateral and multilateral." An annex to the agreement notes that funding pledges for 2010-2012 included $10.6 billion from the European Union, $11 billion from Japan and $3.6 billion from the U.S.". states that "delivery of reductions and financing by developed countries will be measured, reported and verified in accordance with existing and any further guidelines adopted by the Conference of the Parties, and will ensure that accounting of such targets and finance is rigorous, robust and transparent. " acknowledges the "scientific view that the increase in global temperature should be below 2 degrees Celsius" and states that "we agree that deep cuts in global emissions are required according to science, and as documented by the IPCC Fourth Assessment Report with a view to reduce global emissions so as to hold the increase in global temperature below 2 degrees Celsius, and take action to meet this objective consistent with science and on the basis of equity." 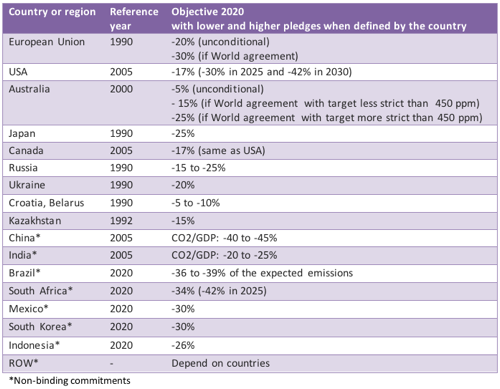 Annex I Parties developed countries agreed to submit "quantified economy-wide emissions targets for 2020" while developing countries "will implement mitigation actions". Signatories to the accord will both submit their commitments and actions to the secretariat by January 31, 2010. General agreement on "the crucial role of reducing emission from deforestation and forest degradation and the need to enhance removals of greenhouse gas emission by forests and agree on the need to provide positive incentives to such actions through the immediate establishment of a mechanism including REDD-plus, to enable the mobilization of financial resources from developed countries." States that "a significant portion" of funding for reducing "emissions from deforestation and forest degradation (REDD-plus), adaptation, technology development and transfer and capacity-building" should "flow through the Copenhagen Green Climate Fund." The "accord" states that "a High Level Panel will be established under the guidance of and accountable to the Conference of the Parties to study the contribution of the potential sources of revenue, including alternative sources of finance, towards meeting this goal." In pursuit of the ultimate objective of the Convention as stated in its Article 2, Being guided by the principles and provisions of the Convention, Noting the results of work done by the two Ad hoc Working Groups, Endorsing decision x/CP.15 on the Ad hoc Working Group on Long-term Cooperative Action and decision x/CMP.5 that requests the Ad hoc Working Group on Further Commitments of Annex I Parties under the Kyoto Protocol to continue its work, Have agreed on this Copenhagen Accord which is operational immediately. 4. Annex I Parties commit to implement individually or jointly the quantified economy-wide emissions targets for 2020, to be submitted in the format given in Appendix I by Annex I Parties to the secretariat by 31 January 2010 for compilation in an INF document. Annex I Parties that are Party to the Kyoto Protocol will thereby further strengthen the emissions reductions initiated by the Kyoto Protocol. Delivery of reductions and financing by developed countries will be measured, reported and verified in accordance with existing and any further guidelines adopted by the Conference of the Parties, and will ensure that accounting of such targets and finance is rigorous, robust and transparent. countries, small island developing States and Africa. In the context of meaningful mitigation actions and transparency on implementation, developed countries commit to a goal of mobilizing jointly USD 100 billion dollars a year by 2020 to address the needs of developing countries. This funding will come from a wide variety of sources, public and private, bilateral and multilateral, including alternative sources of finance. New multilateral funding for adaptation will be delivered through effective and efficient fund arrangements, with a governance structure providing for equal representation of developed and developing countries. A significant portion of such funding should flow through the Copenhagen Green Climate Fund. 12. We call for an assessment of the implementation of this Accord to be completed by 2015, including in light of the Conventionís ultimate objective. This would include consideration of strengthening the long-term goal referencing various matters presented by the science, including in relation to temperature rises of 1.5 degrees Celsius.